The fastest way to create a basic web hyperlink on a PowerPoint slide is to press Enter after you type the address of an existing webpage (such as http://www.contoso.com). You can link to a webpage, or you can link to a new document or a place in a existing document, or you can begin a message to an email address. Select the text, shape, or picture that you want to use as a hyperlink. Text to display: Type the text that you want to appear as hyperlink. ScreenTip: Type the text that you want to appear when the user hovers over the hyperlink (optional). Current Folder, Browsed Pages, or Recent Files: Select where you want to link to. Address: If you haven't already selected a location above, insert the URL for the web site you want to link to. If you link to a file on your computer, and move your PowerPoint presentation to another computer, you'll also need to move any linked files. Place in This Document: Link to a specific slide in your presentation. Create New Document: Link from your presentation to another presentation. E-mail Address: Link a displayed email address to open up a user's email program. Fill in the Text to display, ScreenTip, and where you want to link to. You can change the color of a hyperlink if you like. If you want to change the display text of a link, right-click it and select Edit Link. 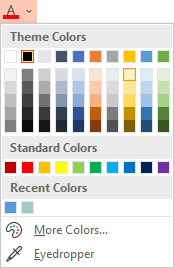 On the Home tab of the ribbon, select down arrow next to the Font Color button to open the menu of colors. Select the color you want for the hyperlink. Once you've inserted the link, you can test it (in Normal view) by right-clicking the hyperlink and selecting Open Hyperlink. You can link to a web page, link to a different place in your presentation, open a different presentation, or begin a message to an email address. In Normal view, select the text, shape, or picture that you want to use as a hyperlink. The Insert Hyperlink dialog appears. 2 - ScreenTip: Text shown when you point your mouse at the linked text on the slide. Note: PowerPoint for macOS can't link to a specific slide on another presentation. You can link to different places in a presentation, such as first slide, last slide, next slide, or slide titles. Highlight the text that you want to act as the hyperlink. The Link dialog box opens. In the Display text box, type the text you want to be visible on the slide for the hyperlink. To test the hyperlink, select the View tab on the ribbon, select From Current Slide in the Start Slide Show group, and then click to follow the link. Unlike the PowerPoint desktop application, you can’t link to slides in the same presentation or to a different presentation from slides in PowerPoint Online. Additionally; you can’t currently add a link to a picture or shape. On the slide, enter the text you want to turn into a hyperlink. Tap the text to select it. On the Insert tab of the ribbon, select Link. Or: You can make a link to a recent web address or recently open file by selecting the item from the Recent Items list that appears. 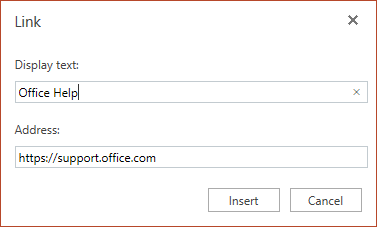 This feature is available to Office Insiders only right now. 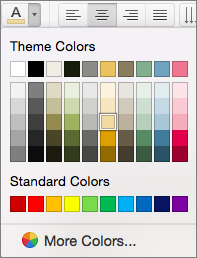 On the Home tab of the ribbon, tap the Font Color button to open the menu of colors. Or: You can make a link to a recently open file by selecting it from the Recent Items list that appears.